Don't forget to check out the blogs of the other DT Members too .... their cards are gorgeous! 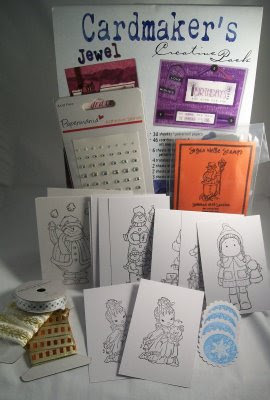 Other Products ... Stickles Ice Glitter For Image, SU Dazzling Diamonds Glitter For Snowflakes, HOTP Brads. I love this card. I love all the attention to detail. I love those little brads in the corner. I love the muffs and how you did it! Thanks for the Challenge this week. It certainly is ALOT of fun! this is gorgeous, Love the snowflakes, the softness in which you have coloured anya is beautiful. Beautiful colouring of your image and I love the stamped snowflakes on the DP. Aw so cute, love the sparkle. Beautiful Teri, i like the addition of the sparkle to the furry bits what a super idea. Please nip over to my blog as there is a little something for you to collect. So pretty. I love the image, the colors, the layout. You sure do make the best cards. I love seeing anything you make. always a masterpiece!